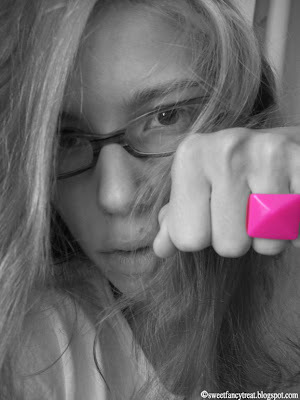 Plastic rings: yes, yes and yes. Why? Because they come in all shapes and colors, are cheap and can be kept on while washing hands. Soap is good on them, still take care with salt water, it can damage them for good. I got mine a couple of days ago in some purple shade. I'm still debating on how this color can be called, even though in the photos it looks kinda... plain pink. Hah. And since I brought this topic up, these are the sandals I mentioned some time ago. Wore them a few times since then and they are so comfy! They have these little bumps on the inner sole which make me feel like I'm having my feet massaged while I walk. It is a strange description, I know, but it's only to best explain why they rock. I think they are made from rubber of some sort, they are so flexible! They are from Ipanema, the same as these other faves of mine. Good. Plus! They are strappy, and that's always a bonus. Oh, and bonus points if you treat yourself with a matching manicure. I used nail decorations and then covered them with clear nailpolish. Just one finger per hand. No need to go over the top. Small details make the world go round, and only those who can spot them know. Love that solid bit of pink on the finger!